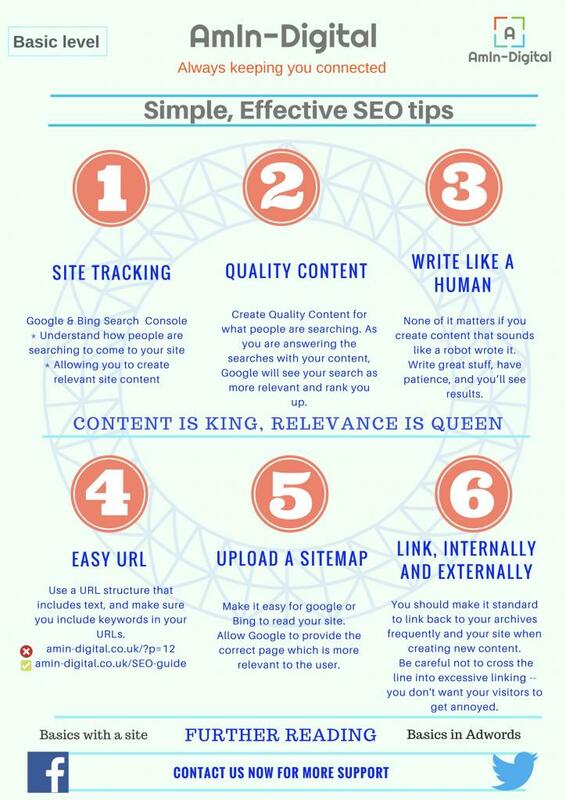 Simple & Effective SEO tips for your business. As you create a site, you need to think about SEO from the start. Here are a few key tips that are key for a successful website. We have ranked them by what order you need to do these in. The key to Effective SEO is Quality Content. Get Google Search Console on your site. This is so important and must be done ASAP. As data cannot be backtracked, start collecting it today. Quality Content is what you are after, and honestly it is quality over content. Produce material once every other work. Just make it top quality. Make your content appealing, try not to sound like a robot. Make your URL’s easy to understand. Let the user and search engine know what the landing page content is about. Provide a site map to Google and Bing search engines. If you provide this, you will let the search engines understand your site and content. This helps search engines provide better results for consumers who are searching. Link your content internally and externally. Just make sure you do not provide excessive linking as this disrupts the reader. Hopefully with these simple SEO tips you are on a good start for your business.